“Whilst there is evidence that Jody McIntyre was inadvertently struck with a police baton, the investigation found that the actions of officers were justifiable and lawful given the volatile and dangerous situation,” the force added in a statement. However this is not accepted by Jody McIntyre and he asked “Why are the police investigating themselves? Well it is not news that disabled people have been frequently denied choice or freedom on the basis that ‘professionals’ were acting in their best interests or that it is more convenient for authorities to ignore needs. 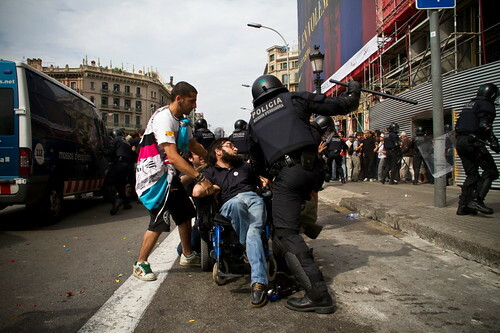 Today at DPAC, we also received photos in the e-mail telling us about the wheelchair user in confrontation with the police on Barcelona. However judging from the other photos, the Spanish police were much much more brutal to all protestors and even without understanding the language I am appalled by watching the video (in Spanish) at what has happened in Plaza Cataluña in the beautiful city of Barcelona -one of the most accessible cities in Europe. The Spanish police were let loose on protestors who looked defenceless with their arms in their air in seeming surrender while police were clearly hitting sitting people indiscriminately with their batons. Is this happening in Europe? What has these people done other than protest to merit such treatment?